Chicago DIY Film magazine, December 14, 2011. 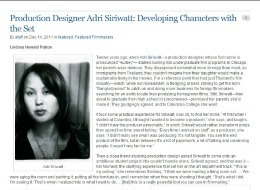 In a series of articles on ‘below the line’ film workers, Chicago DIY Film magazine focuses on those less gloried roles in filmmaking like lighting, editing and, in Adri Siriwatt’s case, production design. Read the profile online here. 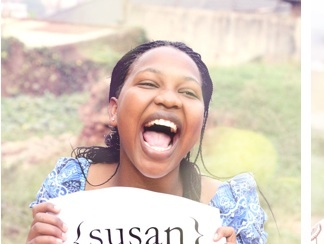 I spent about six weeks in Kampala, Uganda, getting to know the girls of Sseko Designs, who work together to create sandals that will a) be sold in the States and b) fund their own college educations. I visited them almost daily, sitting under the shade of the mango tree (a favorite spot to glue shoe soles, for many of them), talking about everything from swimming to ambitions to boys, and these profiles were the result. 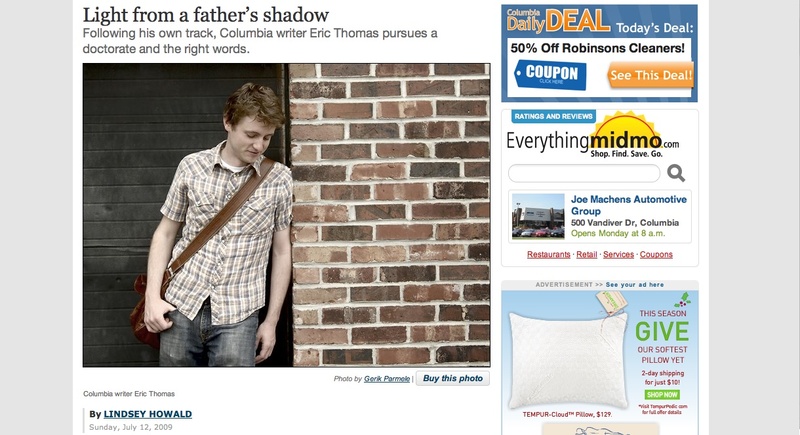 The Columbia Daily Tribune, July 12, 2009. Eric Thomas, a doctoral student and promising writer, is haunted by the ghost of his dead father who appears in various incarnations in Thomas’ writing again and again. Read it here. The Columbia Daily Tribune, June 21, 2009. 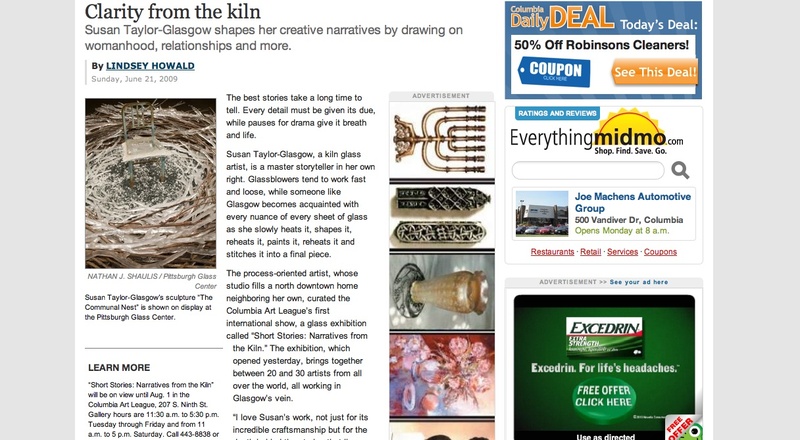 Susan Taylor-Glasgow is a widely-recognized glass artist whose work can be found at Heller Gallery in NYC. Read the profile here. 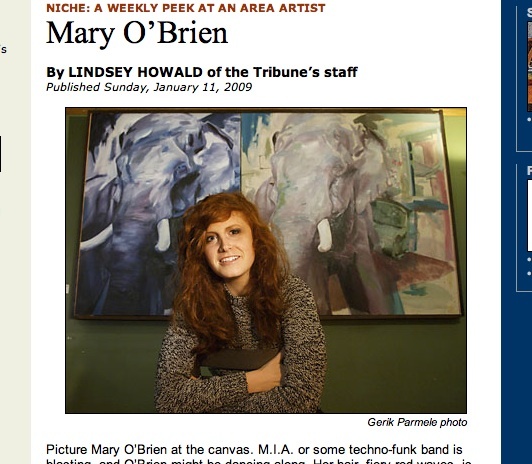 The Columbia Daily Tribune, January 11, 2009. A local university art student covers the walls of the Artisan cafe with her giant, quirky canvases. Read it online here. 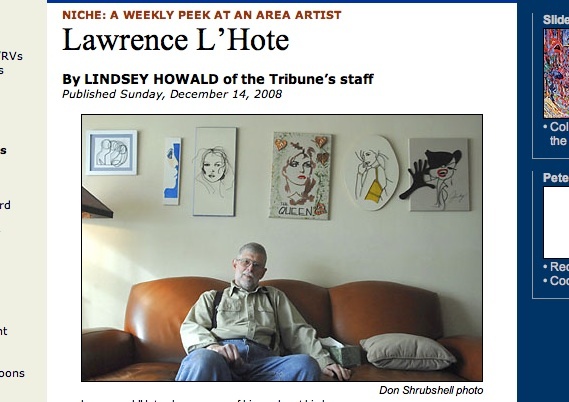 The Columbia Daily Tribune, December 14, 2008. After retiring L’Hote went off in search of interesting objects in trash piles. What came of that were some fascinating works of mixed media art. Read here.